Samsung Electronics, the leading global TV manufacturer for the 13th consecutive year, today launched its flagship line of 2018 QLED TVs and AV products at the 2018 First Look New York event at the American Stock Exchange building in Manhattan. 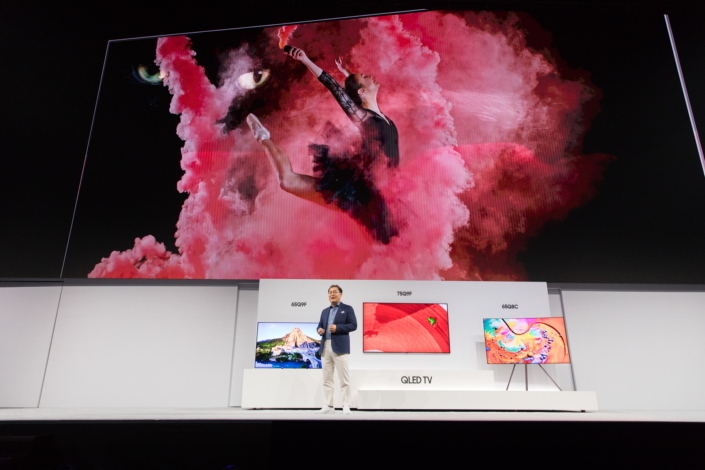 The company unveiled its next generation of QLED TVs to about 1,000 attendees, and demonstrated new, improved features that enhance the TV-viewing experience like never before. During the keynote presentation, Samsung Electronics President of Visual Display Jong-hee Han and other Samsung executives explained how the 2018 flagship TV line offers an unmatched home entertainment experience, meant to remove barriers to setting up and displaying the TV and streamlining access to content in a way that enables consumers to spend more time doing the things they love. The large-screen zone, which showcased the stunning picture quality of Samsung’s new line-up with enhanced color and contrast for a variety of situations, such as gaming and watching movies or sports. Samsung also displayed its acclaimed 146” The Wall, Micro LED technology-based modular screen, to be commercialized for home use. The movie zone featured Samsung’s multi-dimensional N950 soundbar with Dolby Atmos®, slated to become available later this year. The soundbar demonstrates how vibrant, powerful surround sound can enhance the home entertainment experience. The Ambient Mode zone showcased how the QLED TV redefines what it means to be “off” with new technology that transforms the TV into a beautifully functional screen which provides a multitude of information including news, weather and traffic, and which can also play music or completely blend into the wall behind it. The new 5-meter (included with QLED TV purchase) and 15-meter (available as an option) One Invisible Connection, with power cord and data cables merged into one durable cord – an industry first – enabling users to place the TV where they want, how they want, without a tangled mess of cords. Samsung’s 2018 Smart TV set-up is simple and can be done on the consumer’s most used device – their mobile phone, via the SmartThings app. Demonstrations also illustrated how consumers can use their voices to control their entertainment and viewing with the introduction of Bixby on Samsung’s TVs. The 2018 QLED line will be available this month in the US. For more information, visit www.samsung.com. *SmartThings is available on iOS and Android-powered devices. ** Bixby service ability may vary by country or carrier. Voice Command recognizes English (U.S.), Mandarin Chinese and Korean. Not all accents, dialects and expressions are recognized. The list of features that can be controlled by voice commands via Bixby will continue to expand. Mobile functionality compatible with Samsung Galaxy 8 series or higher with Bixby function. Samsung Account log-in and data network (wifi or internet connection) required to fully operate Bixby features. ***The product line, details and availability vary depending on the region. ****One Invisible Connection applies to Q7 and higher models except Q8F. One Remote Control applies to NU7400 and higher models.